We look forward to many more successful Heartfelt Hounds! Our first success was in partnership with Operation Wolfhound in Sierra Vista. AGR successfully placed Mac, a psychiatric service dog, with a veteran who suffers from Post-Traumatic Stress Disorder ("PTSD"). 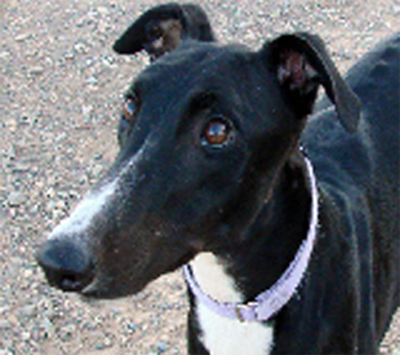 Mac is a rescued greyhound placed by AGR free of charge with a veteran in Tucson. The veteran had been homebound for many months. 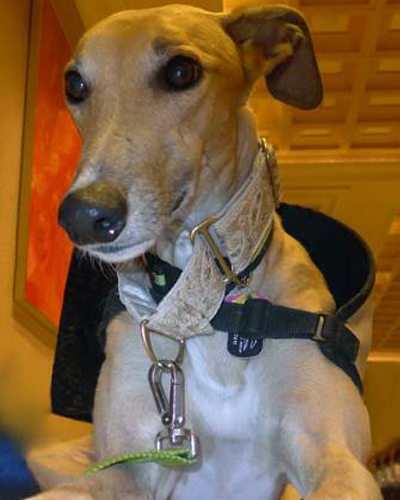 Mac has given his person the confidence to leave the house and reconnect with his friends and family. 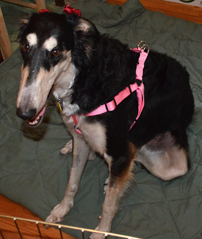 AGR’s second successful placement was a rescued sighthound named Mr. Fry. He received this name because he was abandoned in a Fry’s food store parking lot and had figured out how to operate the automatic door so he could get warm. 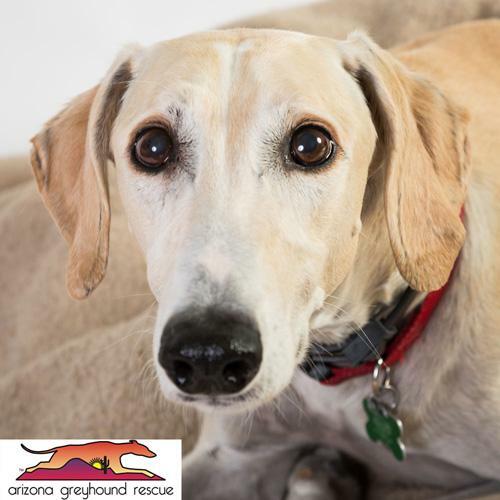 Mr. Fry is trained as a Therapy dog and is permanently placed with Sunrise at River Road, a senior living retirement and memory care center in Tucson. Mr. Fry’s service has led him to competition in the American Humane Association HERO DOG AWARD this year. He did not advance to the finals, but he is truly an AGR Hero! 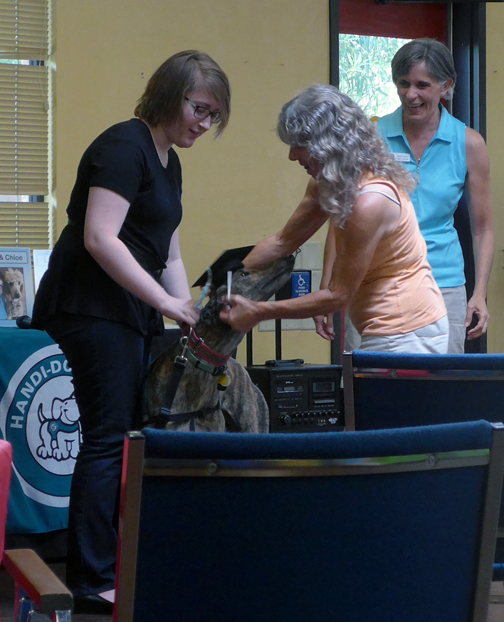 Our third success came with the placement of Jewel as a trained Emotional Support Animal ("ESA"). She was placed to assist a veteran in Phoenix with his daily routine and activities. Jewel is a Russian Wolfhound and was trained by one of AGR’s volunteers who fostered Jewel until her placement. Blaze is our fourth success and was placed as a Service Dog with a female recipient. 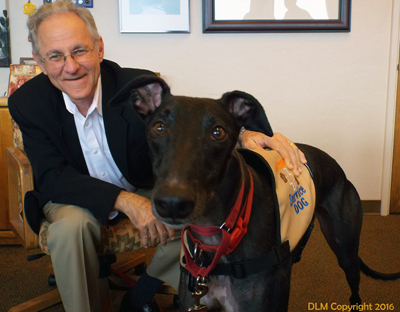 When Blaze was a newly petted out two-year-old retired racing greyhound, he was identified and assessed as being a viable candidate for the Heartfelt Hounds service dog program. Blaze now serves as a trained Service Dog that provides support to his owner for balance and mobility issues as well psychiatric support. 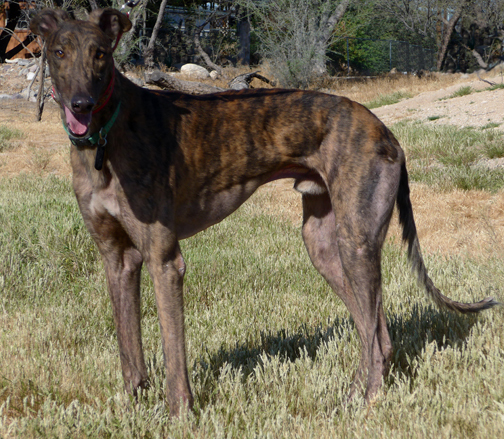 Rama is a Pharoh Hound that came from the shelter in ___. She was placed as an Psychiatric Service Dog with a veteran in Sierra Vista. 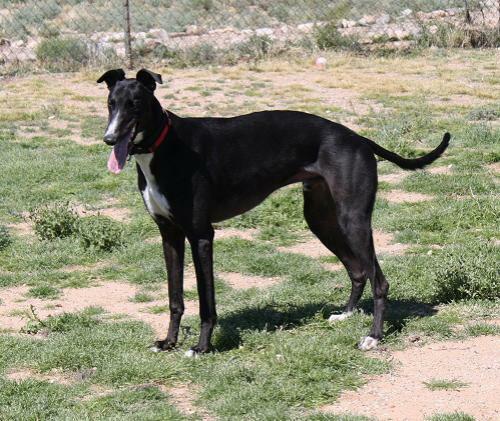 Our fifth success is the placement of Pippin (his name was Wallace) with a recipient in Tucson. Pippin and his person went through the rigorous service dog training with our partner, Handi-Dogs. Pippin just passed the Public Access Test and is now a certified service dog! Congratulations to Pippin and his person! 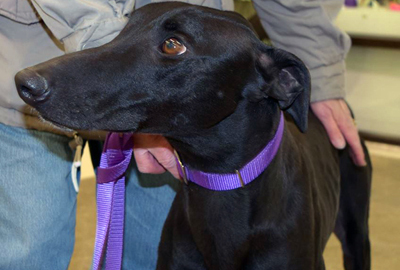 Trick is a Service Dog In Training in the Heartfelt Hounds Program. Trick is Tucson's spokeshound for the Don't Leave Me campaign to educate the public that Hot Cars Can Kill. Trick has recently been matched with his person, an Army Veteran. Please watch for updates on his progress! Jazzie was placed as an Emotional Support Dog. Rocket and his Mom are taking some time off but will re-enter the Service Dog Training program soon. 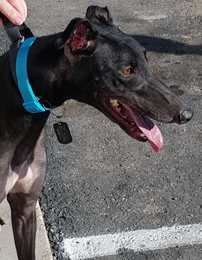 Kip (was Roach) will take his Canine Good Citizen Test, be matched with a recipient, and he will continue his training for the Heartfelt Hounds Program. Kip is a Lurcher. Lurchers are 7/8th Greyhound and 1/8th hunting dog... in Kip's case, Coonhound. 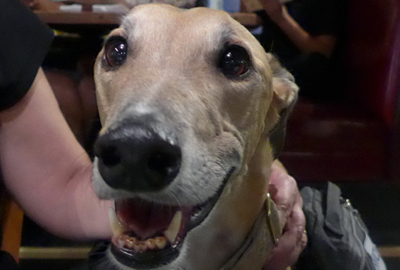 While Lurchers are survivors of underground racing, their most common trait is that they love people. 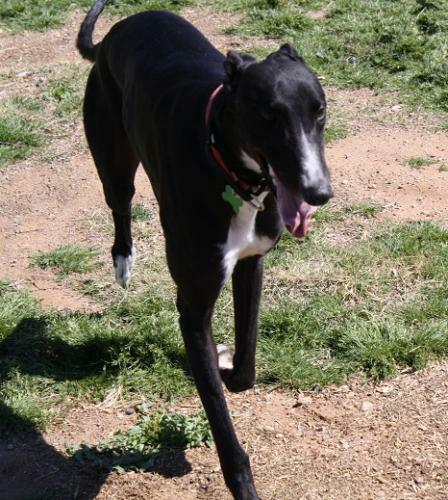 Estimates are that there are about 5,000 lurchers in need homes at the end of the mid-west racing season. 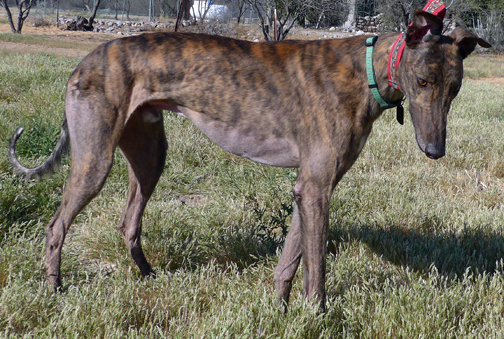 Read more about lurchers and the American Lurcher Project. You can also check them out on Facebook. Who Will Be Our Next Heartfelt Hound?? ?